Nassau is perfect for sun, sand, and surf. Experience the wonder of a thriving coral reef or the intrigue of a sunken wreck on a dive excursion or tour via glass-bottomed boat. Soft white sands and clear waters perfect for snorkeling can be found in many places across the island, but Cable Beach is a hidden gem open to the public. Alternatively, swim with dolphins, meet stingrays and sea lions, or take a Segway tour around Blue Lagoon Island, just a short ferry ride away. 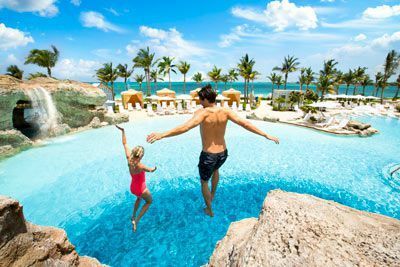 Travelling with kids is a breeze when visiting one of the biggest attractions on the islands, Aquaventure Water Park at Atlantis Paradise Island. Aquaventure will keep families busy with a multitude of exciting waterslides and pools. Nature enthusiasts won’t want to miss Ardastra Gardens, Zoo, and Conservation Center. Here visitors will enjoy a variety of native vegetation and the unique opportunity to get up close with flamingos, parrots, and colorful rainbow lorikeets. Discover Nassau’s storied history as a safe haven for pirates, a slave trade hub, and also a hotly contested territory between the British, French, and Spanish until the late 18th century. Walk the Queen’s Staircase to Fort Fincastle, a Bahamian landmark built by slaves in tribute to Queen Victoria’s help in the abolition of slavery in the Bahamas. Seeking a little native Bahamian culture? Visit The National Art Gallery of The Bahamas, an exhibit of paintings, crafts, and more by local artists, all housed in a restored building. 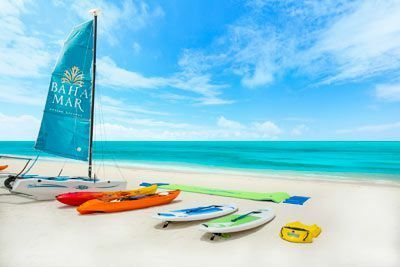 Located on Cable Beach, Grand Hyatt Baha Mar offers you a piece of paradise in The Bahamas. Explore the city of Nassau, dive into pristine waters, and soak up the sun. 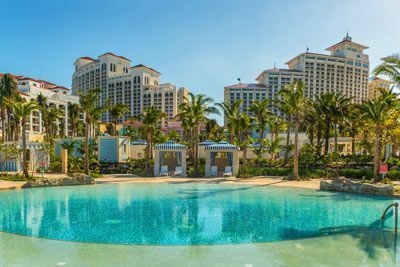 A destination within a destination, Grand Hyatt Baha Mar offers a luxury stay during your island getaway. Enjoy miles of sun-soaked beaches, interesting eco-attractions, and the vibrant community of Nassau. Play the night away at the Baha Mar Casino, featuring 100,000 sq ft of gaming excitement. Hit the links at the Resort's dynamic 18-hole, 72-par Jack Nicklaus Signature Golf Course or enjoy a tennis match on one of the following surfaces: clay, hard tru or grass at the The Racquet Club at Baha Mar. Indulge and stay fit at the 30,000 sq ft ESPA at Baha Mar with state of the art fitness facility. Unwind in one of six awe-inspiring pools, exlcusive to resort guests or lounge on 3,000 feet of sugary white sand. From cocktails on the beach at Out Island Bar to Mediterranean cuisine served in an open-kitchen ambience at 3 Tides and everything in-between, guests can enjoy island-inspired and global cuisine crafted by a team of highly acclaimed local and international chefs. For added convenience, 24–hour in-room dining is also available. Fountain View guestrooms offer one king bed or two queen beds (based on hotel availability), patio or balcony, flat screen TV, coffee service, mini-bar, iHome bluetooth docking station, laptop-sized electronic safe, make-up mirror, hair dryer, push bathrobe, slippers and espa Bath products, iron/board. The Grand Hyatt Baha Mar is located 10 minutes from the Lynden Pindling International Airport (NAS). $100 November 9, 2019 to December 9, 2019. No refund after December 9, 2019; however, 50% of tuition paid may be applied toward tuition for another NWS program within the next 12 months. Cancellation must be made in writing.